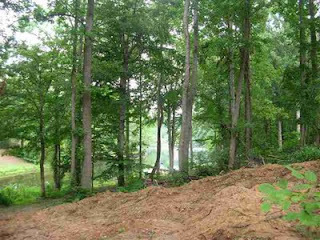 Earlier in the year I advertised and sold the lot at 126 Walnut Lane Extended in Dyersburg's Lakewood Subdivision. The previous owner had already cleared the lot and dug the basement and poured the footer. With the septic tank permit about to expire(purchased by previous owner) this current owner had the septic tank and fill lines installed. The lot sold for $20,000 because the previous owner no longer wanted to build. I am not sure why but now the new owner has decided not to build and wants to sell this beautiful Lakewood waterfront lot(1.3 acres). I am contacting all my contractor buddies because this is a beautiful piece of property and because it is priced for a quick sale at $25,750,it should sell pretty quickly. We have house plans drawn up by Gregson Blueprinting that are part of the documents associated with this property. Almost one year ago I sold a lot on Cherry circle(on other side of Lakewood) and my client just completed building his new Lakewood home. This lot is compariable with that lot except the septic tank and fill lines are already installed and that lot sold for $26,000. Call Mike today at 731-589-7841 to walk over this beautiful building lot and fill out a purchase agreement.